This is a pretty bouquet of flowers ready for delivery to Baldivis. This pretty combination of roses, gerberas, carnations and chrysanthemums makes a perfect gift for new born baby girl. Here we have a box arrangement with Protea and Leucodendron ready for delivery to Baldivis. This Protea box arrangement is part of our “Gifts Under $50” range. Beautiful spray roses grown in Baldivis WA. We love to support the local flower farms. Buying direct from local farms allows us to guarantees fresh flowers delivered to Baldivis WA. See our website www.hangingbasketflorist.com or call us on (08) 9527 5562. Hanging Basket Florist deliver flowers and gifts to Baldivis, Settlers Hills and all suburbs in the Baldivis area. The arrangement below with gerberas, lilies and Easter Eggs is a special custom design for an Easter delivery to Baldivis. Hanging Basket Florist deliver to Stocklands Baldivis Shopping Centre 6 day a week, and are open on Sundays form 11 – 4 at Rockingham Shopping Centre. 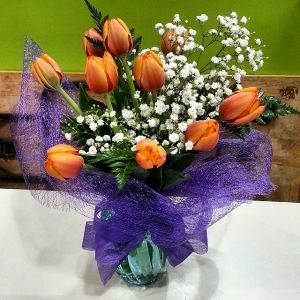 This beautiful bouquet is on its way to Baldivis to brighten someones day. This cheery combination of sunshine yellow lilies, sunflowers and chrysanthemums is sure to bring out the smiles. With our low cost options and convenient online ordering, it is a simple thing to send someone in Baldivis flowers and make their day just that little bit brighter. A bright sunny flower for a cloudy autumn day. This beauty is destined for a birthday bouquet which will be delivered to Baldivis today.